While most biographers take a fairly negative view on this woman who paved the way for modern evangelism, Epstein treats her well without glossing over the negative areas in her life and ministry. It was fascinating and inspiring to read about this prominent female evangelist! It was also a good warning for what can happen to leaders when they are burned out, try to vindicate themselves or are misunderstood by the public. Other books for class: The Making of A Leader by J. Robert Clinton. This seminal book on leadership is a must read. I had learned some of the principles over the years working for InterVarsity but it was great to read them from the source. That the World May Believe- The Life of John R. Mott. An insightful look at a man who believed God wanted to work powerfully in a generation of students to change the world. I was amazed to read that he won the Nobel Peace Prize for mobilizing people to care for war-torn areas in Europe. This book isn’t even out yet but I was asked by Al Hsu at InterVarsity Press to review it. It was difficult to keep my “reviewers hat” on because it was so helpful as a wife to learn about ways I can improve my marriage & communication with Dave. I highly recommend reading it when it comes out this year! Out of the SaltShaker & into the World. O.k. this is kind of embarrassing. I’ve never read this book before. It was voted by Christianity Today as one of the top 50 books that have shaped evangelicals. In addition to that, it’s by a woman evangelist! 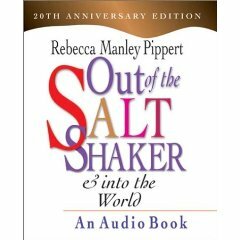 I even had breakfast with the author, Rebecca Pippert at Urbana a few years ago to ask her questions and advice about being a woman proclamation evangelist. I sure as heck didn’t tell her that I hadn’t ever read her book. There is just no excuse for not reading this sooner but I’m glad that I am now! I’m about 1/2 way through it. 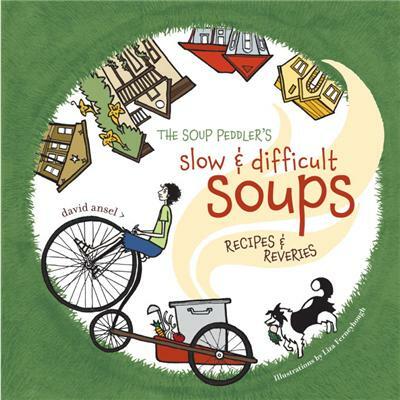 The Soup Peddler’s Slow & Difficult Soups. This has been such a fun read! I haven’t tried any of the recipes yet but I’m looking forward to whipping up a pot of Armenian apricot soup this week thanks to this funky recipe included in this book. It’s a great story of a guy who was sick of the corporate world, moved to a hippie area in Austin, Texas and began selling soup from the back of his yellow bicycle. He has a great vocabulary and a knack for shaping a story in such an amusing way. Plus, since it’s winter it’s nice to have a few new soup recipes to try to stay warm. None of his soups actually look all that difficult to make- he does make his stock from scratch, but you could easily sub in canned broth for any of his recipes. I’ve been reading this before I go to bed, which hasn’t been the greatest idea because I go to sleep hungry for soup! What have you been reading lately? Anything fun? I’d love some parenting book recommendations now that I’ve got a toddler! ← friday fluff- jeggings. I’m totally down. 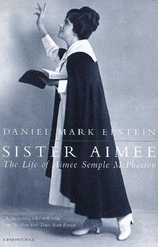 Thanks for the recommendation about Aimee Semple McPherson. It does my heart good to read that your read Bobby Clinton’s book, “Making of a Leader.” I miss him! I am reading “What the Dog Saw” by Malcolm Gladwell. It’s a compendium of articles/essays that he wrote for The New Yorker. I just picked up “Making it Stick” – a book about communication. I hear it’s great. I’ve read part of the introduction. That’s about it for me. Happy reading! I wish I had more time to read! I did just finish the 4th book in the Uglies series by Scott Westerfield. Great, entertating, thought provoking teen/young adult fiction. Last night I picked up Mindless Eating to give that book another go. I tried reading it before and got sidetracked by fiction as I often do when I try to read non-fiction. I just got in the mail today “Green Smoothie Revolution” by Victoria Boutenko which I bought mostly for the recipes but will read through the additional content sometime this week. I also got in the mail today “Make it Fast, Cook it Slow” by Stephanie O’Dea. She has a great blog for slow cooker recipes but I find having my recipes in a cookbook does me more good then online. Looking forward to trying lots out of this book. Thanks for a great selection of good books! I just finished finished The Old Curiousity Shop (Dickens) and am on the last four pages of When Helping Hurts: How to Alleviate Poverty Without Hurting Yourself…Or the Poor. EXCELLENT book–great relevance for: urban ministry, international relief development, and people leading/directing/going on short term mission trips. SO good. And I’m slowly going through Andrew Murray’s Raising Your Children for Christ. It’s very good, and really relevant for where I am in parenting. (I think I told you about this one.) It’s basically an easy-to-read, devotional-style, practical theology for Christian parenting. It goes through the scripture narrative and draws practical parenting frameworks from each one. FYI, we have finalized the title/subtitle of the Tim Muehlhoff book as Marriage Forecasting: Changing the Climate of Your Relationship One Conversation at a Time. Releasing Nov. 2010.
terrific title! I am already recommending it to people- glad I have a release date to share now.